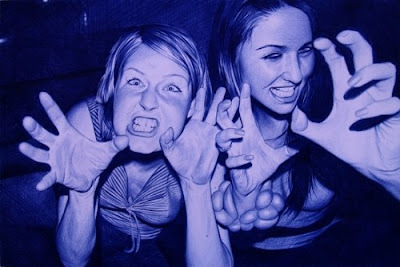 All The Hot: Incredible Ballpoint Pen Art. 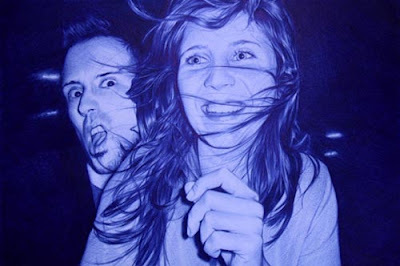 These may look like photographs, but these amazing pictures are the creation of the Spanish artist Juan Francisco Casas, who creates his large artworks using just a blue ballpoint pen. He uses up to four 14p ballpoints on one picture, and his works are already a sell-out at exhibitions and gets up to £3,750 each. Formerly a traditional painter, Juan began the drawings three years ago based on photographs of nights out with his friends. His photo realistic ballpoint pen drawings are based on the incredible detail photos that he takes on his camera. 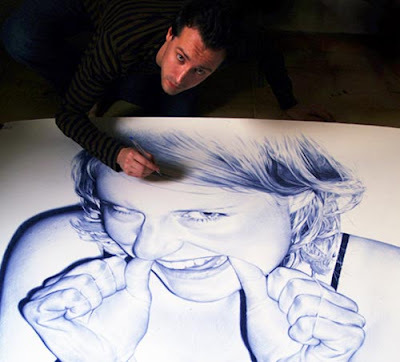 We have seen many artists who can drawings of lifelike figures, but not with blue Bic pen! OMG that is fricken insane.